Scorpios encompasses multiple beach areas, a restaurant, a live event space, and ample open-air terraces spilling into the Cycladic coastline. Given the popularity of Scorpios, we encourage guests to book their experiences in advance. Furnished with large, communal tables, our beachfront open-air, open-plan restaurant is thoughtfully designed to accommodate and advocate a dietary lifestyle that nourishes not only the body but also the mind and soul. The Sunset Beach is the perfect perch from which to watch the sun set over the sparkling surface of the sea. Set high above the beach affording stunning views over Paraga and Kavos lagoons and beyond into the vastness of the Aegean Sea, the Terrace is both the prime seclusion and meet-and-mingle social spot at Scorpios. 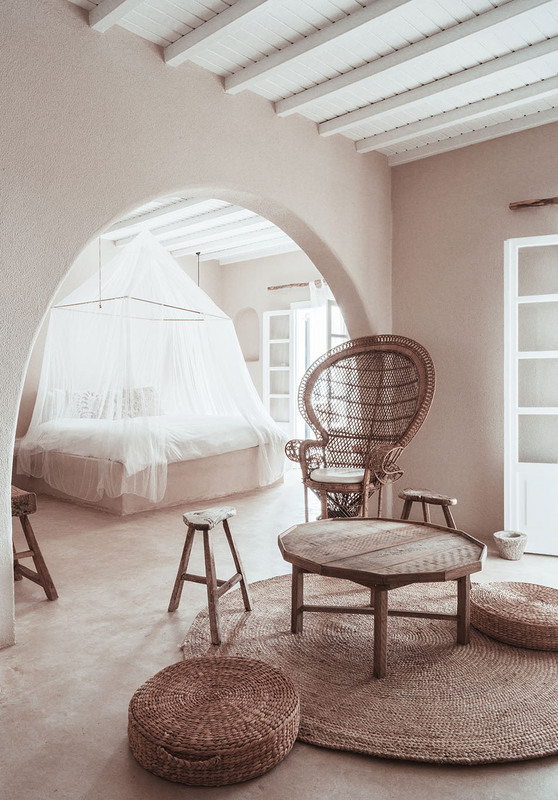 Not just a hotel but a community experiment, San Giorgio is a gorgeous testament to holistic design and radical togetherness situated just 500 meters from Scorpios on a little peninsula between Paradise and Paraga Beaches.